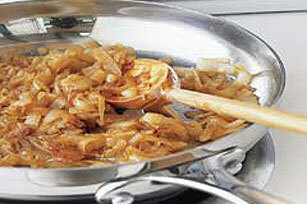 These Healthy Living Caramelized Onions can help so many other dishes reach their full deliciousness potential! Add onions; cook 20 to 25 min. or until lightly browned, stirring occasionally. Stir in sugar; cook 5 min. or until golden brown, stirring occasionally. Keep these delicious onions on hand to serve over grilled burgers or use as ingredients in other sandwiches. Store in a tightly covered container in refrigerator for up to 4 days. Prepare as directed, using KRAFT Lite House Italian Dressing. Serve over grilled steak or chicken.